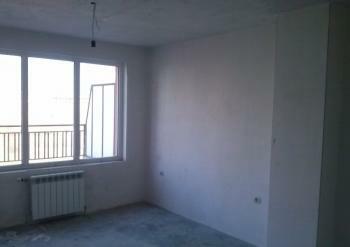 The following apartment is located in a new, closed type complex, in the city of Varna. The building is of best quality construction, and has Act 16. We are offering you a very warm, one-bedroom apartment with central heating and all amenities. The apartment has total living area of 72 sq m and consists of a large and bright living room opening onto the terrace, a kitchen, warm bedroom, also opening onto the terrace, large bathroom with enough space for a shower, bathtub and toilet. The terrace has beautiful sunny views of the garden and can be fitted with a table, barbecue and more. The price also includes a basement. The complex offers security, CCTV, playground and gazebos. The price does not include the final finishing of the apartment. It is sold as at is – according the Bulgarian standards of completion, on plastering and putty.